The Presbyterian Church in Canada Archives – More Ministers Needed! In 1867 Presbyterians were discussing many things, chief among them the need for more ministers. In Canada the Presbyterian Church in its various branches was facing a shortage of ministers and a shortage of funds with which to pay them. 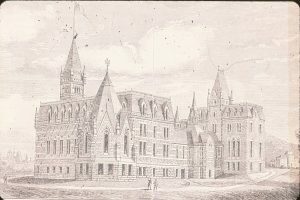 Though Knox College in Toronto had been open since 1844, the number of small congregations, which could not support a minister by themselves, was growing faster than the limited supply of graduates. 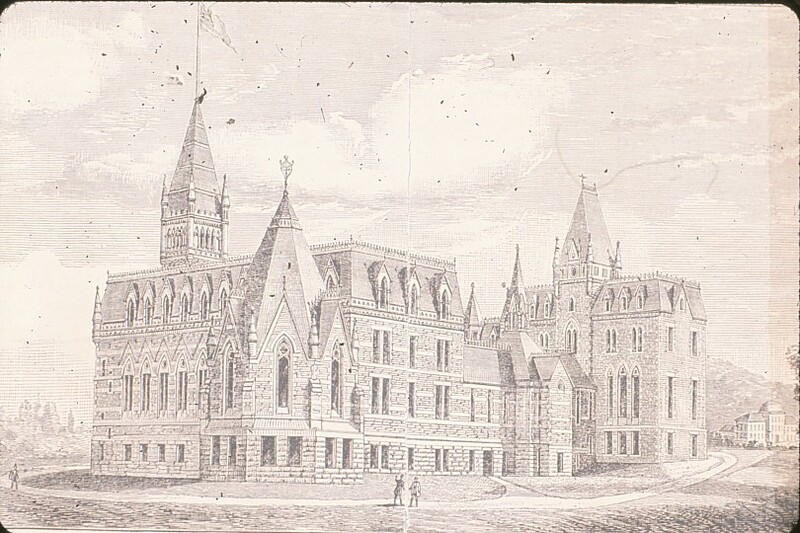 In 1867 the Presbyterian College in Montreal opened its doors and took in its first class of pupils. In 2015 the PCC Archives summer project archivist, Christopher Benitez, created an online exhibit on Presbyterian College, which can be found under Exhibits on this website or by clicking here. 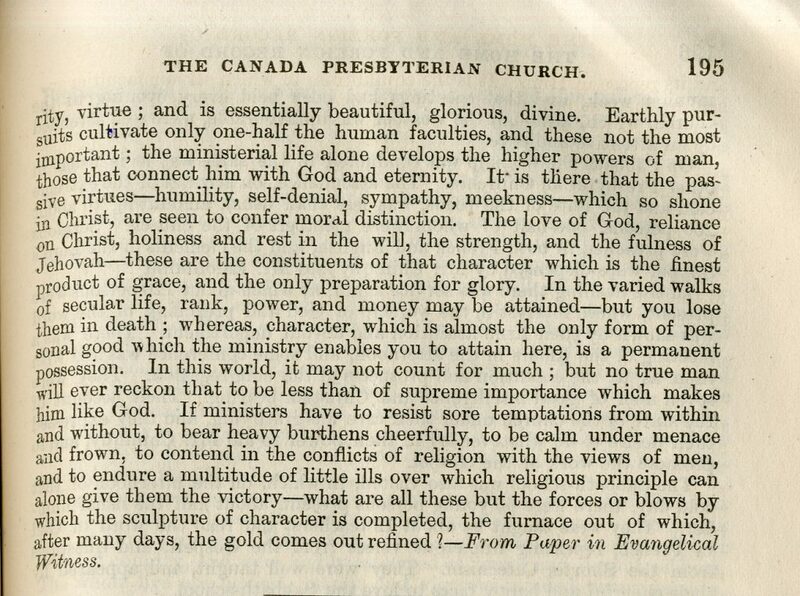 The Home and Foreign Record of the Canada Presbyterian Church published calls for more young men to join the ministry and asked congregations to give more generously to the Church for the upkeep of smaller congregations and ministers’ salaries. 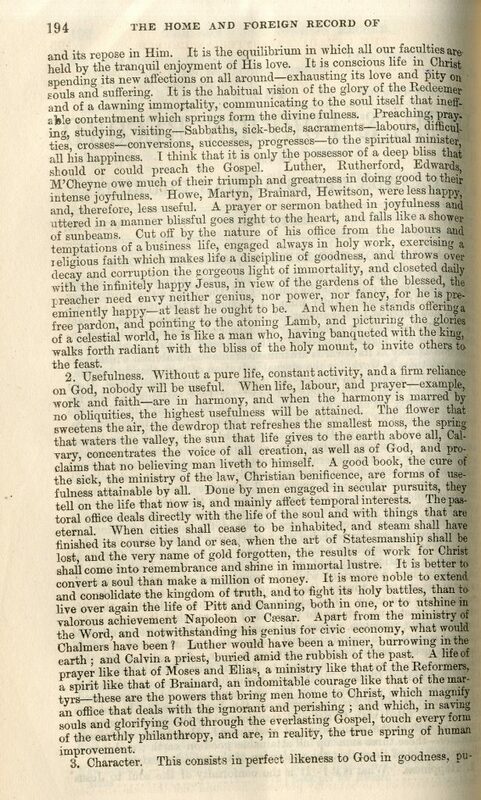 The front page of the May 1867 issue is a plea to church members to consider the ministry as a life’s work, and lays out how this profession produces happiness, character, and usefulness. The number of candidates at the Church colleges in 1867 was too small to fill vacant places as well as extend the church westward. Presbyterian College, Montreal c. 1880s. Image G-118-SC-129. 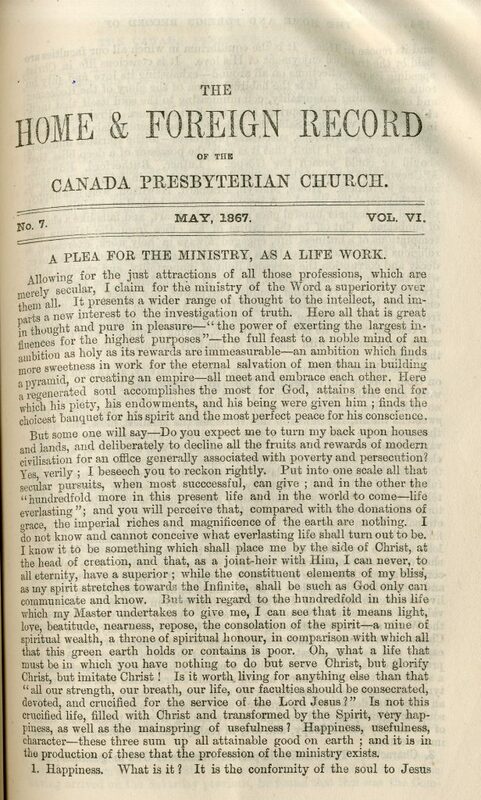 A Plea for the Ministry, as a Life Work – The Home and Foreign Record of the Canada Presbyterian Church, May 1867. 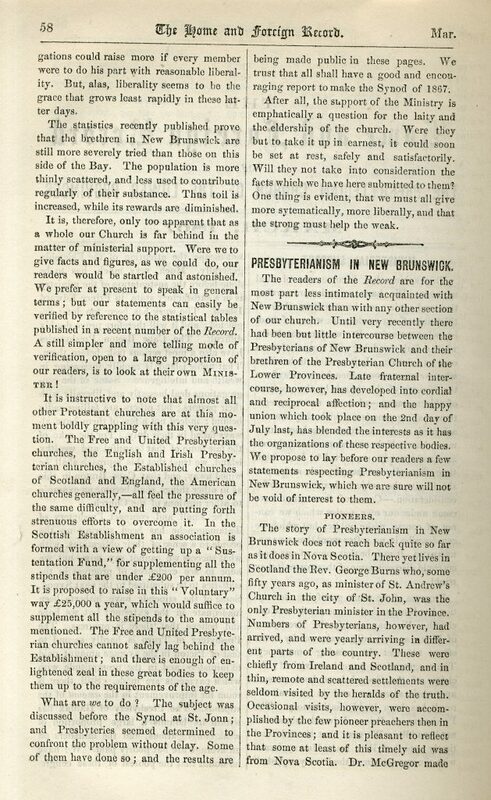 It was noted by the Presbyterian Church of the Lower Provinces “that whatever be the cause or causes, [these problems] are not particular to the Lower Provinces; but seem to be affecting the Evangelical world.” This matter was very concerning to Presbyterians in 1867, and the year closed with hope that more young men would soon come to serve. 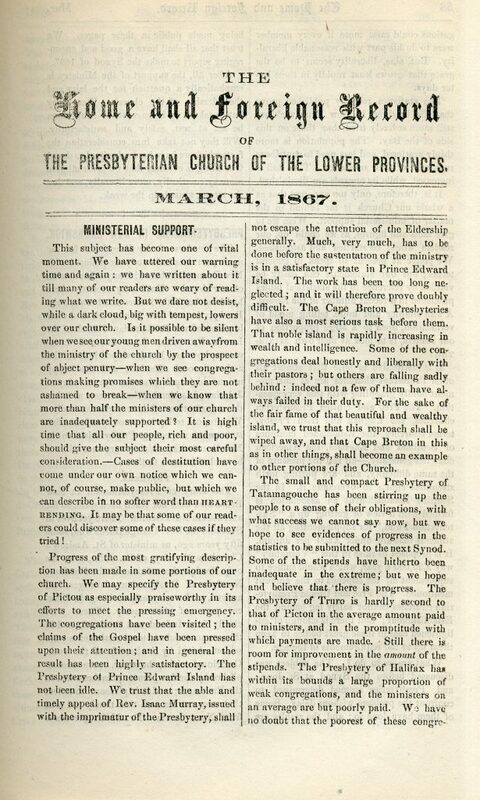 The first two pages of the March 1867 issue of The Home and Foreign Record of the Presbyterian Church of the Lower Provinces.